Or download our free fax app for iPhone & iPad or Android. Yours in seconds. Request one any time. Keep it for 24 hours, or forever with a premium plan. Archive faxes. Sign a fax without printing it. Create multi-page faxes from photos and more! With FaxBurner you can receive and send for free. Get a confirmation fax to your email. iPhone and iPad apps make it easy to compose review and send. Or fax right from email! We give you a fax number and send incoming faxes to your email and iPhone (or iPad). 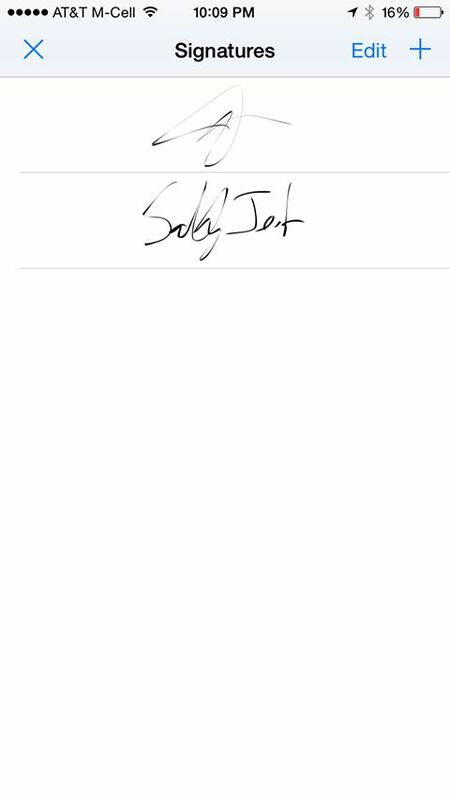 Send a fax using email or the iPhone app as well. 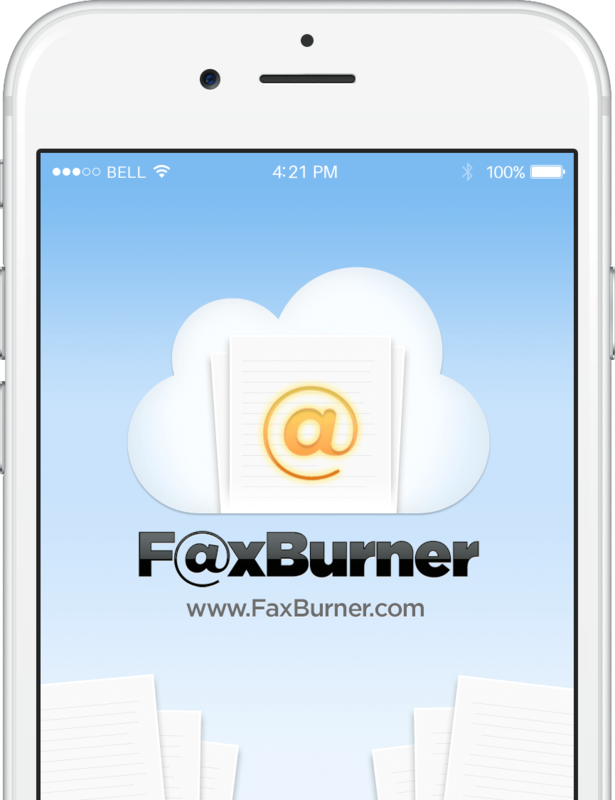 Sign up for a FaxBurner account online, or download our free iPhone / iPad fax app. Login online or from the app any time. Request a fax number whenever you need one. It’s yours for 24 hours, or upgrade to a premium plan to keep your number. Your iPhone or iPad works just like a fax machine. Compose, sign, send, and receive with ease – and get email notifications too. 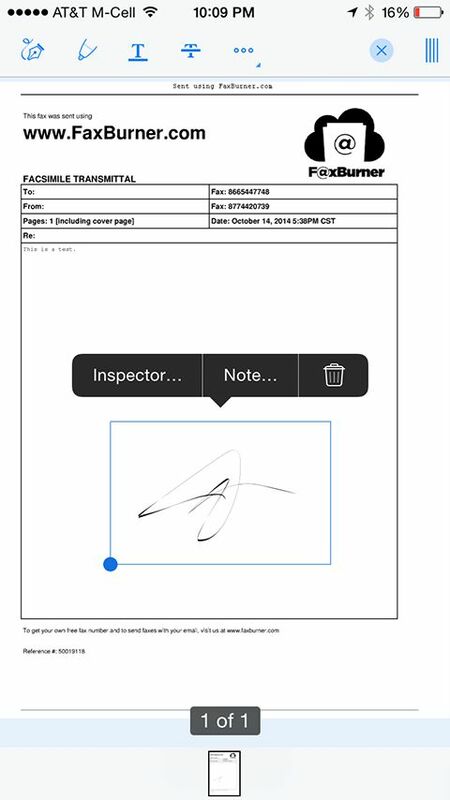 The FaxBurner app is easy on the eyes&mldr; and fingers. Navigate, send and receive faxes with ease and efficiency. A package for every need. Fax freedom is just a few clicks away. Create an account or download our mobile app for free today! Fax, facsimile, telefax or telefacsimile is the name for the telephonic transmission of documents i.e. text or images to another telephone number connected to a printer or output device of some sort. In a time where the internet has taken over almost every single aspect of our lives, it is easy to believe that fax machines have become obsolete. The reality, however, is that many businesses in heavily regulated industries like healthcare and finance are still reliant upon facsimile technology. With FaxBurner, sending a fax is now as easy as sending an email. FaxBurner uses fax to email technology that allows your incoming faxes to be conveniently transformed into emails, using PDFs, as well stored on your mobile device. As many businesses today still recognize faxing as an important mode of business communication, fax to email technology ensures that your business has a truly global reach. In a time where data leaks and hacks are a constant problem, FaxBurner can provide you with peace of mind thanks to our TLS (Transport Layer Security) protocols which keep your faxes secure and ensure a safe fax to email transmission. As a reputable 10 year old company, we’r;re committed to keeping your faxes safe. Having been around more than half a century, fax technology has been integrated into many business process systems like Electronic Medical Records (EMRs) and Customer Relationship Management (CRM) systems. This makes transferring of documents and information easier than ever before. The abundance of services and apps dedicated to sending and receiving faxes clearly shows that facsimile technology is indeed still prevalent today. FaxBurner allows users to send a limited number of free faxes. Start sending and receiving faxes using your very own custom phone number within seconds! It’r;s free faxing at your fingertips. In addition to offering free faxes and fax numbers, FaxBurner also offers multiple premium packages to suit your needs. The free faxing option provides you with a temporary fax number which can be used for up to 24 hours before expiring. Premium accounts receive a permanent number. To receive a fax, simply use your US toll free number. Once you receive your fax, we will notify you via the app and your email. We also store your fax on your smartphone and forward a copy to you via email. Quick and simple! We even notify you with a special fax alert tone. Alongside free faxing support, free users are allowed to send up to 5 pages of free faxes and receive 25 pages of free faxes, per month. You do not need to worry about hidden fees - FaxBurner generously gives you 25 fax pages a month for receiving and 5 fax pages lifetime for sending. FaxBurner also offers several affordable premium packages if you require more pages, a permanent number, or advanced features. The free version may not always be available so be sure to download your app today! FaxBurner is also conveniently integrated with common apps such as Dropbox for even easier faxing. For small business owners, FaxBurner is the perfect solution to help you significantly cut down on costs. With its easy to use interface and design, you can send a free fax in just a few simple steps. From the FaxBurner app, simply choose “r;compose a fax.”r; Then send your pdf or photo to our unique fax email address with your recipient’r;s fax number as your email subject line, or fax directly from the app. 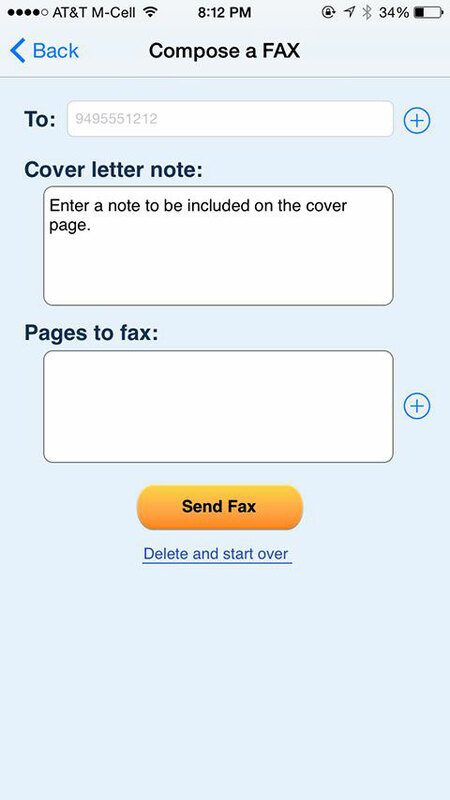 You can select the pages to fax from your phone gallery or simply snap a photo of your document. Easily sign and complete forms and fax them back to your recipient without ever needing to print a single page. Congratulations, you have just sent your first free fax with FaxBurner. With this completely easy to use and reliable app, you can be done in about 30 seconds. And, you save paper, ink, and energy in the process. With FaxBurner, sending faxes has never been easier. Email to fax technology has eliminated the need for businesses or individuals to own a fax machine or a phone line. Go ahead and shelve that old fax machine. Not only does Fax Burner simplify the process of sending a fax, it also significantly reduces the costs of owning and buying a fax machine. All you need is a smartphone, email account and an internet connection to enjoy affordable or free faxing. 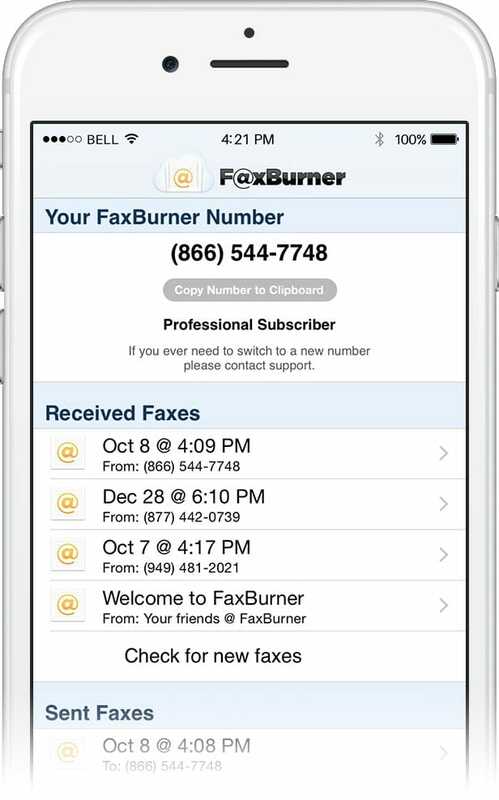 Download Fax Burner’r;s app from the app store and register on our website to start sending free faxes immediately. Just like that, you can turn your Android device or iPhone into a machine for free faxing. Upon registration, you are given a 24 hour disposable fax number. Request a new one whenever you need it. For more established businesses who would like to keep their fax number, FaxBurner also offers a range of packages to accomodate the sending and receiving of 500-2000 pages per month. Now, you can receive and send faxes on the go with your smartphone or mobile device, even when you’r;re out of the office. With our technology, you get to enjoy a whole new world of convenience. Who needs to be in the office to receive a fax anymore? Why waste time and space on noisy, clumsy and wasteful fax machines? This revolutionary app technology eliminates unnecessary printing and wasted paper, with your faxes stored securely in the cloud. FaxBurner is simply the most convenient way to go. Larger businesses tend to receive a larger amount of faxes as compared to a newly-formed organization. Thus, it would not be cost effective to invest in a fax machine and fax number for the very occasional use by many small-medium businesses. However, as a business owner, you would most likely still need to send and receive faxes from time-to-time. A savvy business owner would most likely gravitate towards the option which provides the best of both worlds. In this case, FaxBurner is just the solution for you. With FaxBurner, you receive a free fax number that is disposable after 24 hours. You will not need to commit to purchasing a fax machine or registering a phone number. Enjoy all this commitment-free with no monthly fees or hidden charges. Request a new free fax number whenever you need one. If you wish to retain your free fax number, or accommodate a larger number of pages, simply upgrade to the premium plan. Sign up for your FaxBurner account today, and get all set up in about 30 seconds!